Willy Wonka’s famous chocolate factory is opening at last! But only five lucky children will be allowed inside. And the winners are: Augustus Gloop, an enormously fat boy whose hobby is eating; Veruca Salt, a spoiled-rotten brat whose parents are wrapped around her little finger; Violet Beauregarde, a dim-witted gum-chewer with the fastest jaws around; Mike Teavee, a toy pistol-toting gangster-in-training who is obsessed with television; and Charlie Bucket, Our Hero, a boy who is honest and kind, brave and true, and good and ready for the wildest time of his life! I love this book!!! I have read it countless times, and each time I read it I love it just as much. It’s definitely a classic, and a favorite at our house. This time I read it aloud to my daughters (9 and 6) and they loved it too! The best part was that as soon as I started reading, my boys (13 and 11), who I read it to years ago and they have both read it a few times themselves, would come over, sit with us and listen as well. It doesn’t matter how old you are, the magic in this book pulls you in. I love the characters in the story. 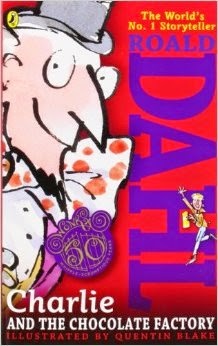 Mr. Dahl did an excellent job of describing each of the characters and their personalities. From the old grandparents at home in bed to the children in the factory, each character comes to life on the page. My favorite characters are Charlie and Grandpa Joe. I especially like how Grandpa Joe bursts out of bed and suddenly has so much energy. Willy Wonka is a great character, too. I also love the creativity in this book. All the different rooms in the chocolate factory are unique and well described. I want a chocolate river in my house!!! The story is well written, it flows well, is easy to read and understand, and is just so much fun. I love that it teaches kids to dream and to use their imaginations. I also love that it talks about throwing the t.v. out the window and reading instead. 🙂 (I’ll have more on that in a different post coming soon!) It also teaches kids not to be selfish, bratty, or disrespectful. As I was reading, I noticed that there is one swear word. I was shocked, actually, when I came to it, but it is there. I skipped over it so my girls didn’t even know, but a silent reader would see it. Other than that, and a few minor “accidents,” it is clean. Well, it does get a bit sticky and gooey in places, but there is no “intimacy” or violence. I highly recommend this book! It’s great for silent readers and read-alouds!